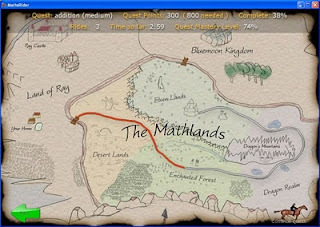 What do horseback riding, hurdles, magic flowers and princesses have to do with math? Quite a lot if you give Math Rider a try! This downloadable product brings math to life as students head out on various quests. Progress toward that goal is measured by their performance in math drills for addition, subtraction, multiplication and division. Move over flashcards--Math Rider is on the scene. This program has a single focus of helping students master the basic math operations. As soon as a student begins to learn addition and have some skill using a keyboard, they can use this program. And while older users may not be as enamored by the graphics, the ability to work on math drills is still more enjoyable than using a traditional set of flashcards. New users can begin with practice runs to get a feel for the program. A horse is running and jumping hurdles. Hurdles are successfully cleared when the user answers a math question correctly. A box appears with the math question and the student uses the numbers on the keyboard to enter the correct answer. When doing the program, math problems enter the screen on the right and you must answer before the problem gets to the horse (after trying it myself, I found this to be a bit harder than it looks!). My youngest son (age 8) had a bit of a rocky start with the program. He was close to tears because he was frustrated by trying to respond quickly to the math problem as it traveled across the screen. To reduce his frustration, I changed the settings so that he worked on only the number 1 added to numbers 0-5. We then adjusted to 0-10 and finally 0-12. As his confidence grew, I had him adding 2 to each number, then the 3's and so on until he felt comfortable doing the whole range. When he completed the addition quest, he was ecstatic! He is now working on a subtraction quest. My 11 year old daughter loved this game from the outset. I offered absolutely no assistance. Once the program was downloaded, she logged in and figured out everything on her own. There were some frustrations when she didn't perform as well as she'd hoped but she would continue to try again to get her speed and accuracy to a higher level. She completed all four quests. Both my son and daughter were asking (or should I say begging) to do Math Rider daily. This is a highly unusual behavior for my kids--they do not normally request additional math activities. I was amazed at how quickly my son went from tears to triumph. It's just a really painless way to increase drill skills. Just a side note, my 16 year old was quite impressed with the music playing in the background. If, however, you find that the music (or horse whinnies) are distracting, users can easily turn off the music or just mute the program. We found the product to be a great help with learning and reinforcing math facts. I would highly recommend the program to anyone on a quest to find a fun, creative program to help cement addition, subtraction, multiplication and/or division math facts. Just a few minutes each day will help keep your child's skills sharp and ready to tackle new math adventures! Would you like to read what other reviewers thought of this product? Hop on over to the TOS Crew blog and read for yourself. You can also read reviews from satisfied customers. The program is currently on sale for $37, and Math Rider offers a 30-day money back guarantee so you can try it with confidence--if it works for your family, you'll know you've made a great investment. If it's not a good fit, you won't lose a thing. For general inquires, contact Math Rider by e-mail. Disclaimer: I was given a limited time trial of Math Rider for the purpose of reviewing. No other compensation was received.